Traditionally, fajitas are made in a sizzling hot cast iron griddle, but busy weeknights call for quick cooking, easy-to-clean-up meals. That’s why sheet pan recipes are brilliant. It’s an easy, efficient way to prepare everything you need for a meal on one pan and it's especially perfect for making fajitas. Taco seasoning is a powerhouse, transforming humble ingredients like bell peppers, onions, and chicken breasts into a satisfying, flavorful filling to wrap in warm tortillas. Store-bought taco seasoning is easy and convenient or make your own for a fun weekend pantry project. Choose a colorful mix of peppers for some flair and added flavor. The peppers and onions need a head start to ensure they’re tender enough, so get them roasting in the oven while you slice the chicken into strips. Halfway through, the chicken gets added to the pan (you could swap in beef or pork here, or use all veggies for a vegetarian spin). 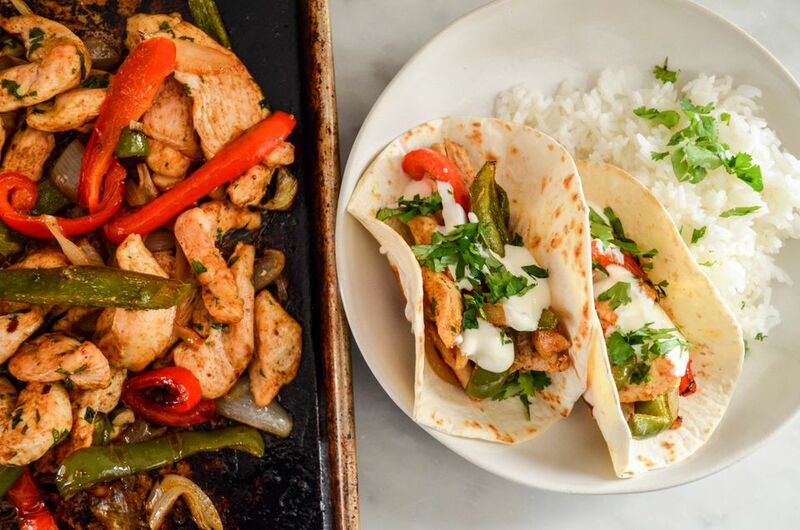 For these sheet pan chicken fajitas, the only extra prep is heating tortillas on the stovetop, an easy task while your oven does the heavy lifting (and something kids can help do, too!). A quick homemade crema—sour cream thinned with a bit of water (or lime juice) for a citrusy twist, and seasoned with salt—adds a refreshing finishing touch to drizzle on top before you dive in to dinner. Gather the ingredients. Preheat oven to 425 F with rack in center position. Cut the peppers in half, remove stem and seeds, then slice into 1/2-inch thick strips. Trim ends of onion and slice into 1/2-inch strips. Add both peppers and onions to rimmed sheet pan. Toss with 1 tablespoon oil and 1 teaspoon taco seasoning to coat evenly. Bake 15 minutes, until peppers begin to soften. In a medium bowl, toss the chicken with remaining taco seasoning, 1/2 the cilantro and 1 tablespoon of oil. Add to pan with peppers and onions. Bake 15 minutes more, until chicken is cooked through and peppers are tender. Cut the lime in half. Juice one half and cut the other into four pieces. In a small bowl, whisk together the sour cream with 1 tablespoon water and 1/4 teaspoon salt until smooth. Set aside. Cook the tortillas in a small skillet over medium heat until warmed and lightly browned in spots, 1 to 2 minutes each side. Transfer to plate, and cover with towel to keep warm. To serve, divide the chicken, peppers and onions between the tortillas. Drizzle the crema on top, and sprinkle remaining cilantro. Serve with lime wedges and rice on the side, if using. For a faster way to heat the tortillas, wrap them in foil and place them in the oven during the last 5 to 7 minutes of cooking the peppers, onions, and chicken. They’ll heat up nicely and the ease of prep is enough to forgive the lack of char you’d get from heating them in a skillet. Cooked rice isn’t a necessity, but it bulks up the meal. You could even opt for a fajita bowl and serve the tortillas on the side.